Windows Hive apps news Specter app for Windows Phone Removed from Store. 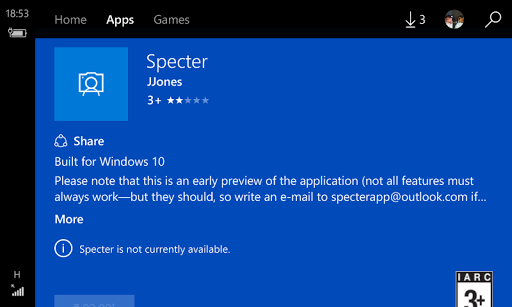 Specter app for Windows Phone Removed from Store. Specter , The snapchat third party app lands on Windows store sometime ago , specter was the client app for Snapchat on Windows phone and PC . As we all know that this app will be removed anytime soon , Today Microsoft pulled out " Specter " app from Windows store the app is no more longer on windows store now as shown in screenshot " Specter currently not available "
If u bought this app and created account on it then your snapchat username is blocked now. Stay connected with us we'll inform our readers for all apps and News about Windows (Microsoft).